6WINDGate packet processing software is deployed in Tier 1 networks worldwide to help OEMs build networking products with a competitive advantage. The Linux kernel has many overheads that degrade overall performance. As a result, Linux requires extra processing resources to increase application performance and cannot scale with the number of cores. This problem is compounded with virtualization as the layers of bottlenecks increase. 6WINDGate includes a fast path data plane architecture that removes Linux bottlenecks by running in user space, outside of the kernel. As a result, 10x to 40x performance is achieved using less processor resources versus standard Linux for Layer 2-4 networking applications in physical and virtual environments. 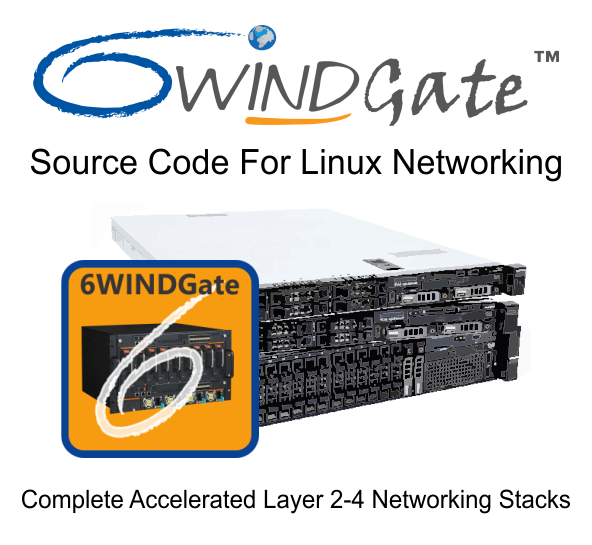 Linux + 6WINDGate = Linux: 6WINDGate is non-intrusive to Linux and does not require any modifications to the OS, hypervisor, OpenStack, Open vSwitch or SDN controllers. Complete Networking Stacks: 6WINDGate reduces development time from years to months by providing complete stacks for popular applications such as IP Forwarding, IPsec, TCP, Accelerated Virtual Switching and more, with acceleration for more than 50 protocols. Performance Scales per Core: Achieve linear performance scalability with the number of cores running 6WINDGate. Examples include 12 Mpps per core IP Forwarding, 12.5 Gbps per core IPsec, 21 Mpps per core Open vSwitch and 10.3 Mpps per core VLAN. Hardware Independence: 6WINDGate supports a wide range of industry-leading processor platforms including ARM, Cavium, Intel, and Mellanox. DPDK support for multi-vendor NICs including Cisco, Intel and Mellanox further ensure flexibility of choice. Supported Architectures: 6WIND gives customers their choice to select the best architecture for their requirements. Management: 6WIND offers traditional CLI and IT style management based on YANG data models.